For a quarter of a century, two archaeologists and their team slogged through wild tropical vegetation to investigate and map the remains of one of the largest Maya cities, in Central America. Slow, sweaty hacking with machetes seemed to be the only way to discover the breadth of an ancient urban landscape now hidden beneath a dense forest canopy. Even the new remote-sensing technologies, so effective in recent decades at surveying other archaeological sites, were no help. Imaging radar and multispectral surveys by air and from space could not see through the trees. Then, in the dry spring season a year ago, the husband-and-wife team of Arlen F. Chase and Diane Z. Chase tried a new approach using airborne laser signals that penetrate the jungle cover and are reflected from the ground below. 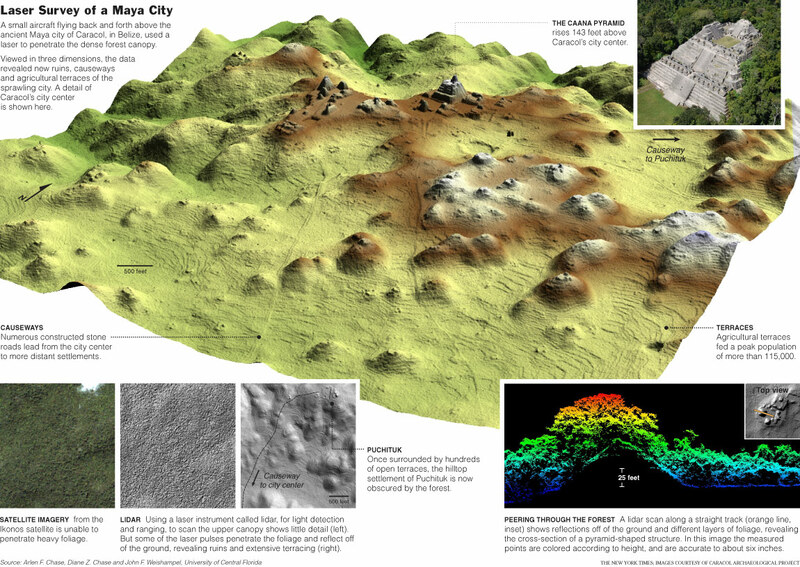 They yielded 3-D images of the site of ancient Caracol, in Belize, one of the great cities of the Maya lowlands. In only four days, a twin-engine aircraft equipped with an advanced version of lidar (light detection and ranging) flew back and forth over the jungle and collected data surpassing the results of two and a half decades of on-the-ground mapping, the archaeologists said. After three weeks of laboratory processing, the almost 10 hours of laser measurements showed topographic detail over an area of 80 square miles, notably settlement patterns of grand architecture and modest house mounds, roadways and agricultural terraces. So, when do we get Google lidar? And when will people be able to see me inside my house? Amazing! It looks like the Indigenous Native People had stripped the land of old growth forests for farming thereby altering the native to alien plant ratios, water usage patterns and the whole ecology of the area. Why do I have a feeling this isn't the laser as most of us understand it? At least not the visible kind. Sounds more like microwave frequencies. This looks familiar, but if something has been posted, it has been a while. To all -- please ping me to other topics which are appropriate for the GGG list. Now that you mention it; about a year, maybe year and a half ago. As near as I can recall it was something like ground penetrating radar that was somehow able to locate what the authors claimed were ancient foundations and the like. This lidar thing is really neat! Think of the military utility of Lidar mounted UAVs. Forests and triple canopy jungles will become naked. I do cartographic work using lidar-generated topography. Lidar is indispensible nowadays. 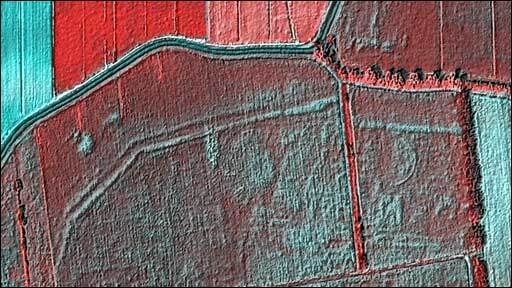 A huge amount of cartographic work done in pre-lidar days is revealed to be worthless once lidar-generated images are made of the areas in question. Yeah, you’re right, I think I’ll try another search. Vulcano ash: First official report by DLR (german counterpart of NASA) released. Gee; a little over two years ago. Time's fun when your having flies! And ground penetrating radar wasn't even close. The ability of satellites to pick up the differences in chemical makeup around ancient limestone structures was the key but, whatever. Even so, how did you FIND that thread?? ?